Like many kids who grew up in the ’80s and ’90s, I discovered Choose Your Own Adventure (CYOA) books in my school library and later at my local public library. I read and re-read many of them and eventually owned a few of them. For those not familiar with the genre of gamebooks, the reader reads the first couple of pages at which point she is faced with a decision. For example, after passing through an antimatter storm, do you keep your spaceship on course or do you return to your home planet? Depending on the choice, the reader is directed to another page where that branch of the story continues. More choices follow every page or two and the story branches off into several directions with many possible endings. For young readers, the challenge of finding successful endings can spur multiple readings of the story. For young authors (I wrote a CYOA story as a writing project in highschool,) the process of creating and managing multiple story lines can be an interesting challenge. For ESL students, both reading and writing CYOA stories can be a compelling way to practice English. The branching structure means the story can grow exponentially. To see just how complex these stories can quickly become, take a look at some of these visualizations of CYOA stories. The first example, pictured above, is from seanmichaelragan.com. This graph clearly illustrates how the stories branch and, in some cases, reattach. Each node represents the page number of each choice. The second example orients the graph horizontally and uses color to denote critical plot points as well as happy or tragic endings. The third example fans the story out from the center, but includes even more information. Happy endings, cliffhanger endings, and reader death endings are noted, but additional text pops up when you mouseover each node describing each decision. 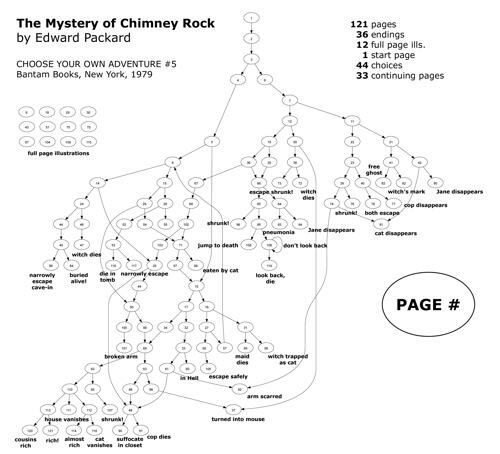 As a fan of both Choose Your Own Adventure stories and data visualizations, I’ve really enjoyed looking through these images. If you’re not familiar with Choose Your Own Adventure stories, I recommend to try to track a couple of them down for you and for your students. Students could enjoy reading, writing, and analyzing these stories, which are accessible to high intermediate readers.